Nick Garlick lived, worked or went to school in just about every part of England before moving to the Netherlands in 1990. After many years working as a freelance technical writer, copywriter, editor and translator, his first two children’s stories were published by Andersen Press. He now lives with his wife in Utrecht, where he’s currently working on more children’s stories. Hi Nick, welcome to GHB. We can’t wait to hear about your latest book, STORM HORSE. When a storm strikes the Dutch Wadden Islands, the wind is strong enough to knock little children off their feet. Waves crash onto the beach. Sand and sea spray fly through the air. The only people who’d dream of going out in such weather are the lifeboat crews. And the horses that, for over one hundred years, pulled the lifeboat into the sea. Why were horses used? Because the Wadden Islands are so flat – and because low tides are very, very low. There’s no place high enough to build a lifeboat house with a ramp running into the sea. So from 1830 until the 1950s, what happened was this. When the alarm sounded, the lifeboat crew would drop whatever they were doing and run to the lifeboat house. They’d take their horses – big, sturdy farm animals – with them. Those horses would then pull the lifeboat through the streets and sand dunes onto the beach. Once there, it was out into the waves, right up to the horses’ shoulders, so the lifeboat could slide into the water. Rescue mission completed, the boat would then be hauled up out of the sea and onto its trailer. And after that, it would be back across the sand and home. Horses have been replaced by motorised tractors now. 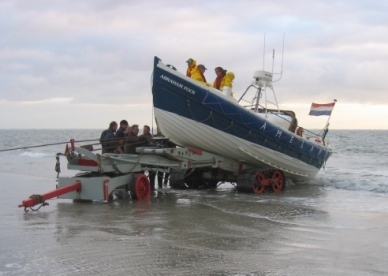 But several times a year, on the island of Ameland, you can see a demonstration of the old ways. It draws hundreds of visitors every single time. This is all by way of answering a question authors get asked a lot. ‘Where do you get your ideas?’ Well, lots of times they don’t know. That’s because ideas grow and merge and the whole process takes so long that by the time they’re ready to write, they’ve forgotten how it all began. Not so with Storm Horse. I know exactly how it began: when I heard about the lifeboat horses. And even though the book isn’t just about them, it was the horses who provided the spark that started it all. Thanks Nick. That was terrific and so are the photos. Storm Horse is on my ‘to read pile’. 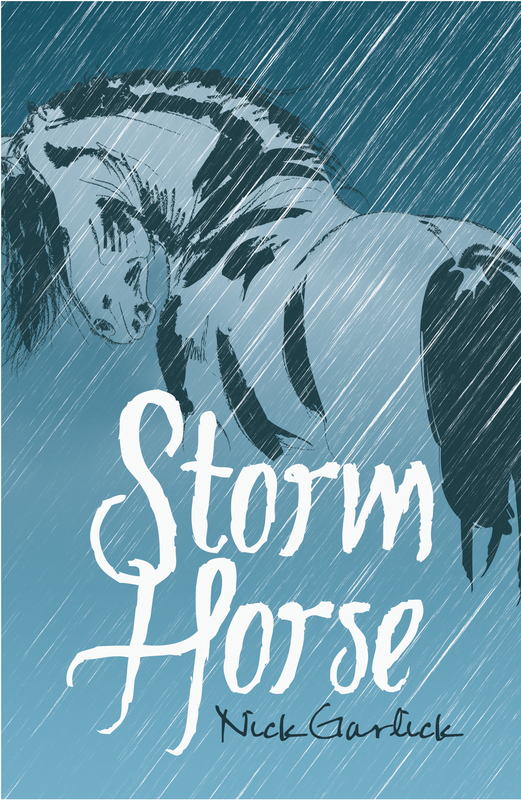 If you’d like to read it too, then Nick and his publisher are giving away 3 copies of Storm Horse HERE at GHB. Tags: guest author, lifeboats, storm horses. Bookmark the permalink. Great story – and great cover! Thanks for posting, Nick!